There are many floods in Williamsport’s history, but one stands apart from the rest as a wake-up call to residents. Fear to repeat and hope to end the constant reconstruction, inspired the populous to build the levee, which has enabled the confident construction of infrastructure and homes in the city. The Baltimore District Corps of Engineers estimated in 1955 that Williamsport sustained $10.5 million in various property damages in the great flood of 1936, or $97.7 million in today’s dollar. In Lycoming County alone, the great flood of 1936 caused $7,225,00 in personal, residence and business loss, $976,988 in State Highway Department loss, $297,073 in public and municipal property loss, $450,000 in agriculture loss. That’s a total of $8.93 million in total loss, according to the report. That equates to $155 million in today’s money, according to the report of loss and damage March, 1936 flood in Pennsylvania, prepared by N.L Lichtenwalner, state director for the National Emergency Council in Philadelphia. Large floods were so frequent, The Bell Agency, a real estate and insurance company, issued a chart matching the approximate height of the river and which streets it would reach: 24.5 ft., Willow and Basin Streets; 25 ft., East Third and Mulberry; 27 ft., West Third and Pine streets; 27.5 ft., Park Ave. and Hepburn streets; 30 ft, Seventh Avenue. Throughout the state, 80 people died, 2,822 people were injured, 2,800 homes and buildings were destroyed, and 55,000 homes suffered damage. At the height of the flood, various disaster relief committees were housing 89,600 people and feeding 216,000. Williamsport was soaring in the 1920s, according to “A picture of Lycoming County Vol 2”, population had grown to 44,507 by 1929, an increase of 20 percent in the nine preceding years, and there were 10,350 dwellings in the city. There were 4,000 motor vehicles sold in 1924 and 22 automobile dealers and repair shops. Further, eight hotels, seven theaters, three pools as well as numerous supervised playgrounds, and athletic fields. However, the depression in the 30s hit Williamsport especially hard, with the Chamber of Commerce fending off reports of people calling Williamsport, “the hardest hit city in the state.” Lycoming Mfg. Co. and Williamsport Wire Rope laid off half their workforce, and U.S. Rubber Co. closed its doors by 1933. Unemployment hit 25 percent in Williamsport. Despite efforts to educate Williamsport’s workforce, the city’s economy was slow to heal and relief from President Roosevelt’s New Deal had only just started in 1935 before the city was caught off guard by over 40 years of the susquehanna calmly flowing by and economic hardships postponing any large scale levee construction projects. There were eight floods over 20ft — 20ft being the point at which the West Branch of the Susquehanna would overfill it’s natural banks– in Williamsport between 1848 and 1894, according to “Floods,” a pamphlet printed by The Lycoming County Historical Society. A 42-year major flood Hiatus and severe economic woes left the city vulnerable. Spring had not quite come in March of 1936. Rains had failed to melt much snow, instead saturating both the ground and raising the water potential of snowmelt around the eight tributaries leading to the west branch of the Susquehanna, according to the Report of loss and damage. The warmer and heavier rains between March 16 and 19 dropped four inches over most of the State, quickly melting the snow. Water rushed through tributaries, through the upper West Branch and towards Williamsport. By the night of March 18, Waters rose to 33.9 feet. Luckily, early warning by city officials saved many lives, limiting the death toll to three. Priscilla Gardner Barrett recalled the night March night in a 1986 Sunday Grit reprint of the flood coverage. She was 9 years old and daughter to a farming family in 1936. Priscilla and her parents left the home that night for higher ground. Water levels rose to flood 70 percent of the city and by mid-morning Wednesday, March 18 all power was lost to the city. Williamsport’s only connection to itself and the outside world was through the radio station WRAK, which kept their broadcast going using car batteries for 100 continuous hours, were dry in the second floor of the, then Williamsport Sun, at 252 W. Fourth St.
WRAK coordinated emergency responders, delivered flood reports from Harrisburg, told people where they could find shelter or food, to boil their water — and repeated news from people bringing in information by yelling rooftop to rooftop or by boat, among other things. Above the floodplain, at his home at 1030 High Street, Al Glaes worked to send shortwave messages through his radio transmitter using morse code to WRAK as well as keep WRAK in contact with other cities — shortwave radio signals can travel hundreds of miles, while AM radio can only travel 100 miles at most. Families and friends missing loved ones lined up to have him tell WRAK to broadcast their whereabouts. “Hello, Al… hello, Al… people on the roof of a house in South Williamsport are awaiting rescue… hello Al.. Come in, Al… try and get Wellsboro and inquire how the gas supply is.. Attention Williamsport users.. Use gas sparingly, the supply here is low,” WRAK transmitted, according to The Lycoming Historical Society. The flood of 1936 was known to many as the “Hello Al” flood or the radio flood, as thousands of thank you letters flooded in from around the county to WRAK and Al Glaes was famous countywide for his efforts. Flood relief poured in from the Red Cross, who initiated a nation-wide donation campaign, and the 496 officers and 5,733 enlisted men of the National guard were called in to assist in the flooding which was “equal to the length of the Western Front during the World War,” according to the Report of Loss and Damage. The city advised people to boil their water for weeks as outbreaks of illness and typhoid fever broke out. 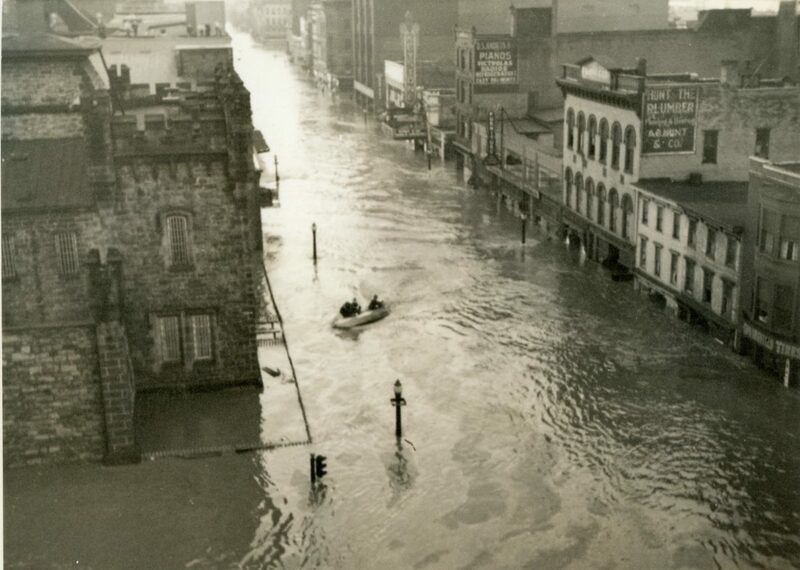 The flood in 1936 was the motivating factor in the Flood Control Act of 1936, as financial and political support poured in to construct a levee to protect Williamsport. Although the depression and World War II put a damper on the construction, the flood of 1946 — which did not match the flood of 1936 in damages or severity — served as a reminder that the levee’s construction was imminent. Hurricane Agnes and the 1972 flood served as a testament to the levee’s protection — built to 36 feet, as it were — as other areas flooded dreadful, Williamsport avoided much of it’s brunt.